PARIS — A known terror suspect gunned down a police officer and wounded two others Thursday on Paris’s Champs Elysees in an attack claimed by the Islamic State group days before France’s presidential election. The shooter opened fire with an automatic weapon on a police car on the world-famous boulevard at around 9:00 pm (1900 GMT), prompting tourists and visitors to run for their lives. 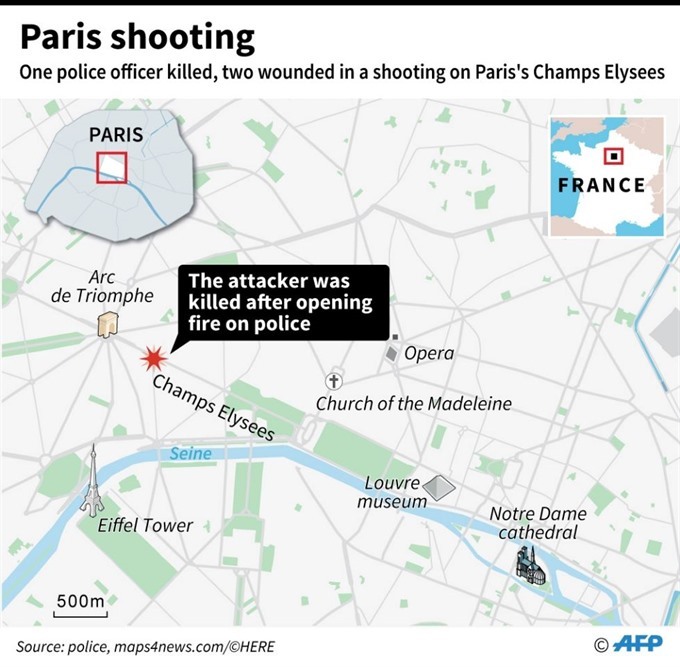 After killing the officer and injuring his colleagues, the gunman was shot dead in return fire while trying to flee on foot, police sources told AFP. "The perpetrator of the attack in Champs Elysees in central Paris is Abu Yussef the Belgian and he is one of the Islamic State’s fighters," said an IS statement published by its propaganda agency Amaq. Observers had long feared an attack ahead of Sunday’s election in France, following a string of atrocities by extremists since 2015 that have claimed over 230 lives. The impact on the outcome of one of the most unpredictable contests in decades is unclear, but far-right leader Marine Le Pen and scandal-hit conservative Francois Fillon immediately cancelled their campaign events on Friday. The shooting comes two days after the arrest of two men in southern Marseille with weapons and explosives who were suspected of preparing an attack to disrupt the campaign which concludes on Sunday. French President Francois Hollande, again forced to address the nation after an attack, promised "absolute vigilance, particularly with regard to the electoral process" and paid tribute to the police. Le Pen earlier welcomed security moving to the heart of the campaign Thursday as she took part in a prime-time interview show alongside 10 other presidential candidates. Though Le Pen and Macron are the frontrunners, conservative candidate Fillon and far-left firebrand Jean-Luc Melenchon have closed the gap substantially in the last two weeks. "The first responsibility of the president is to protect," Macron said on the interview show. "This threat will be part of our daily lives in the next years." The bustling shopping street in the heart of the city was immediately blocked by armed officers after the attack and nearby metro stations were closed. "We had to hide our customers in the basement," Choukri Chouanine, manager of a restaurant near the site of the shooting, told AFP, saying there was "lots of gunfire." A spokesman for the interior ministry Pierre-Henry Brandet paid tribute to the fast reflexes of police at the scene who managed to kill the gunman and prevent further bloodshed on a busy spring-time evening. A tourist was slightly wounded in her knee by shrapnel during the shooting, said a police source, who did not provide the woman’s nationality. "We face a particularly high risk of terrorism," Brandet told reporters. France is in a state of emergency and at its highest possible level of alert since the attacks that began in 2015. The Charlie Hebdo magazine was hit in January 2015, sites around Paris including the Bataclan concert hall were targeted in November the same year and families at a fireworks display in Nice in July last year. In between, there have been a series of smaller attacks, often aimed at security forces. 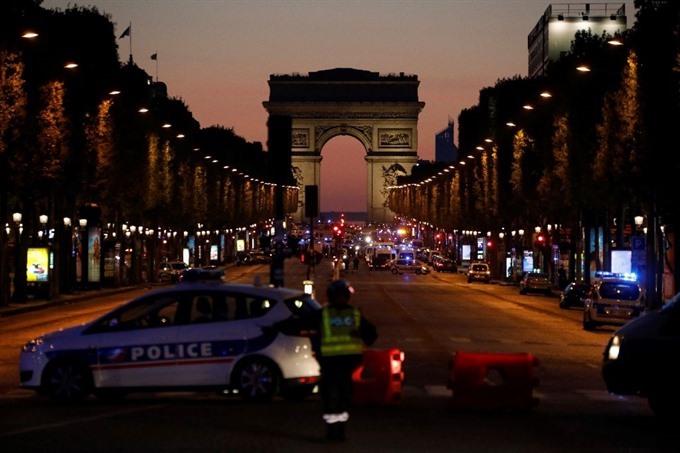 Thousands of troops and armed police have been deployed to guard tourist hotspots such as the Champs Elysees or other potential targets including government buildings and religious sites. In February, a man armed with a machete in each hand attacked soldiers on patrol at Paris’s Louvre Museum. The attacker, a 29-year-old Egyptian, was seriously injured.